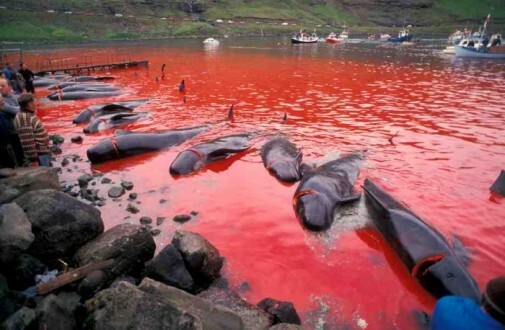 Denmark / Faroe Islands: Nothing Changes After Our Actions 27 Years Ago ! It seems like a lifetime – Joanne, Mark and Trevor were out campaigning about this slaughter back around 19990 / 91. Very sadly, in this modern age, it still continues, some 27 years or so after they hit the streets. See more and a photo on ‘About Us’ – https://serbiananimalsvoice.com/about-us/ – ‘Superstore Protestors Seek End To Slaughter’. Just below the pictures of Joanne. Animal rights groups say that the hunting method, known locally as ‘Grindarap’, must end. 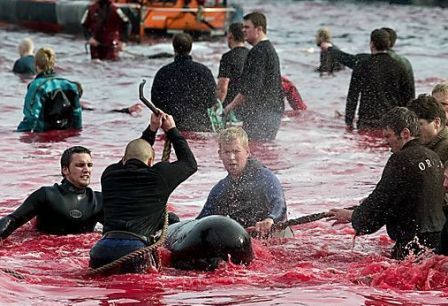 Animal rights campaigners have reported details of the the latest Grindarap – an annual event in the Faroe Islands where locals round up and massacre huge families of whales. The sea turned red as the blood of an estimated 150-200 mammals were sliced to death by hunters from the Danish islands, located in the Norwegian Sea. The Grindarap is believed to date back as far as 1584. It is a method of whaling that drives entire pods of whales and dolphins towards beaches by trapping them with small boats and missiles. The prey, typically short-finned pilot whales migrating through the Norwegian Sea in the summer, are then set upon other hunters armed with knives and lances. There are usually a series of hunts in close succession to one another at this time of year. The whale meat is eaten by locals. Various campaign groups have demanded that the practice, which is legal, be stamped out. “The animals slowly bleed to death. 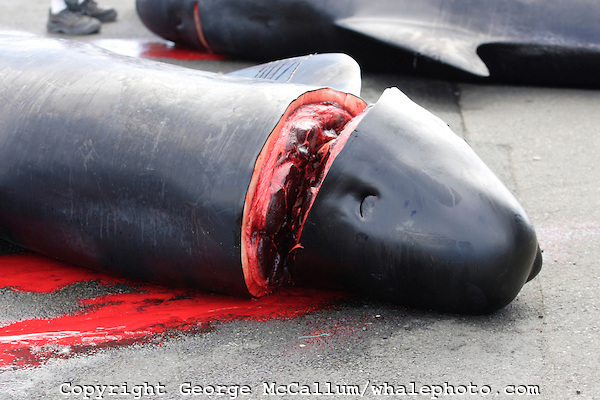 Whole families are slaughtered, and some whales swim around in their family members’ blood for hours. “Whales and dolphins are highly intelligent creatures and feel pain and fear every bit as much as we do,” PETA said.